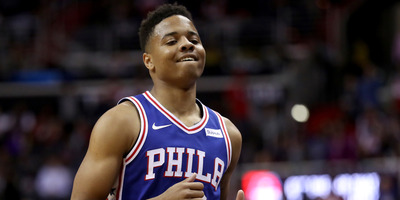 Rob Carr/Getty ImagesMarkelle Fultz didn’t have a great night shooting from the floor, but hitting his first career three was enough to get the Philadelphia crowd going. Should Fultz’s shot continue to improve, he could play a vital role in the Sixers’ fortunes this year. The Sixers had been used to waiting a year for their top picks to recover from injury, but Fultz’s apparent case of the yips was new even to them. Fultz worked through it and was able to help the Sixers down the stretch as they finished the season on a 16-game winning streak. The biggest moment of Fultz’s night came in the fourth quarter. Fultz’s night was far from spectacular, but it’s clear that the Philadelphia crowd is behind him through the whole, for lack of a better term, process. When the Sixers traded up for the first overall pick in 2017 to take Fultz, it felt that a franchise was turning a page – the days of tanking for picks were over, it was time to win. For much of the season, it felt as if the Sixers had a Markelle Fultz-sized hole in their lineup – a creative player that could find his shot, work the pick and roll with Embiid, and be a threat from the outside to spread the floor and open up even more space for Simmons’ creativity.